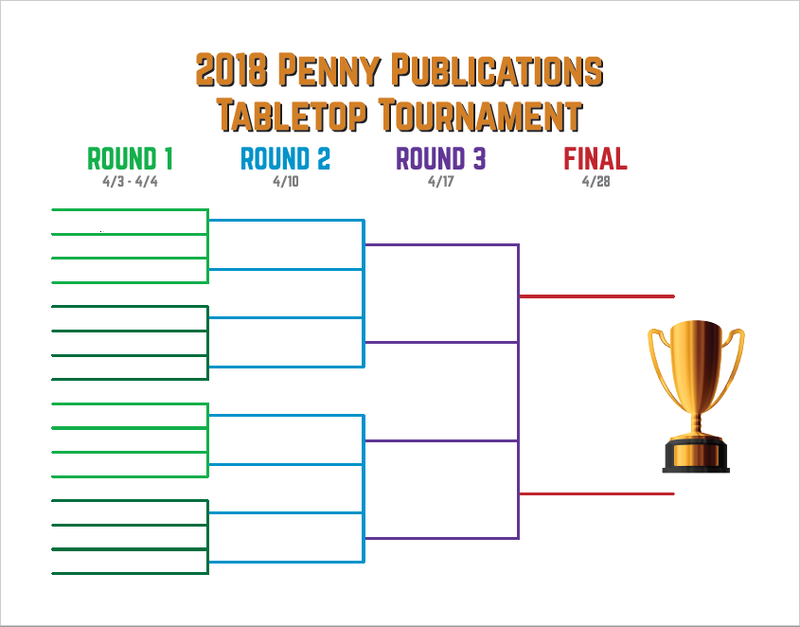 Last week, 15 intrepid members of the Penny/Dell Puzzles crew (as well as yours truly, your friendly neighborhood PuzzleNation blogger) embarked on the first stage of a four-week journey: The PDP Tabletop Tournament. After fast and furious rounds of the anagram-fueled tile game Bananagrams and the pattern-matching card game On the Dot, the field was pared down from 16 enthusiastic puzzlers to 8 worthy contenders who triumphantly emerged, ready and willing to tackle whatever challenges awaited them in round 2. Let’s find out what happened, shall we? Round 2 kicked off in similar fashion to Round 1, as the 8 competitors were split into 4-person groups. Each group of four would play two games. Two winners — one from each game — would come from each foursome and move on to the next round. The two games for Round 2? Qwirkle and Timeline. Qwirkle is a tile game that mixes the gameplay of Mexican Train Dominoes with the Uno mechanic of matching colors or matching symbols. 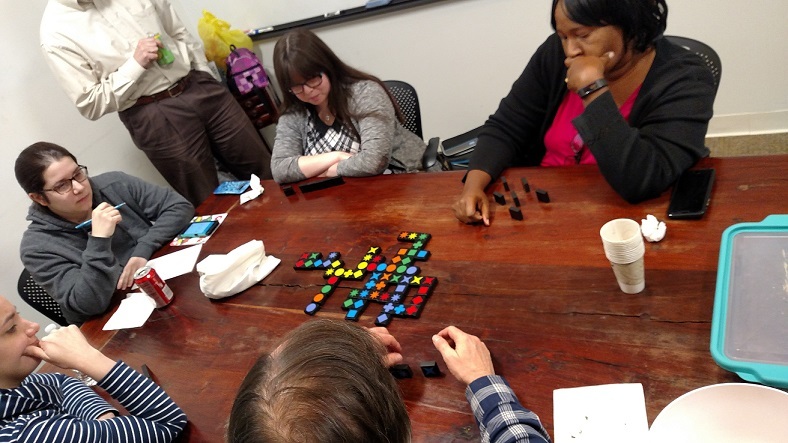 There are 6 different shapes and 6 different colors, and players score points by playing tiles from their hand on a communal gameplay area (similar to Scrabble or dominoes). Neighboring tiles can be the same color (a green square next to a green star) or the same shape (a red diamond next to a purple diamond). But you can’t repeat any tiles within a row (meaning that if a blue diamond is in a row of diamonds, you can’t play another blue diamond in that row). You earn bonus points by completing Qwirkles — six-tile runs that either have 6 different symbols all of the same color or 6 different colored tiles with the same symbol. In our tournament, the player with the highest point total after 20 minutes would move on to Round 3. Group 1 consisted of me, Nikki, Rick, and Sue; Group 2 consisted of Jen (last year’s champion), Jenn, Gordon, and Robin. 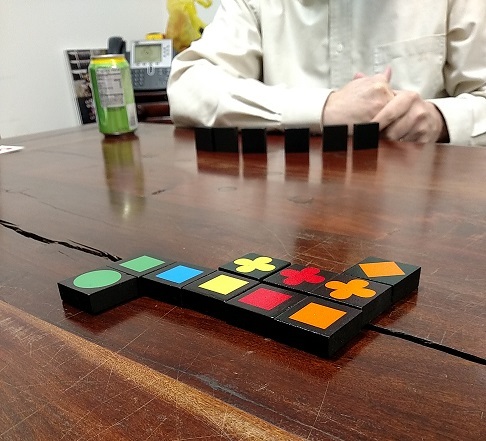 Qwirkle was an interesting choice for the second round, because it offered players less control than the games in Round 1. On the Dot has everyone using the same cards to match the pattern, so it comes down to speed and skill. Bananagrams has a random tile selection, but since you can change the grid at any time to accommodate new letter tiles, you have a lot of control in how you place things. But with Qwirkle, you only have 6 tiles at a time to place, and you’re dealing with one communal play area. So you’re limited in what you can play by the tiles already on the board; if there are no diamonds on the board to match, for instance, you can’t play a diamond tile unless there’s another symbol on the board that’s the same color as your diamond tile. Plus, you can’t just play a lot of tiles, if you have several that match, because you don’t want to leave openings for your opponents. If you add three different colored star tiles to the two already on the board, great, you’ve got 5 points. 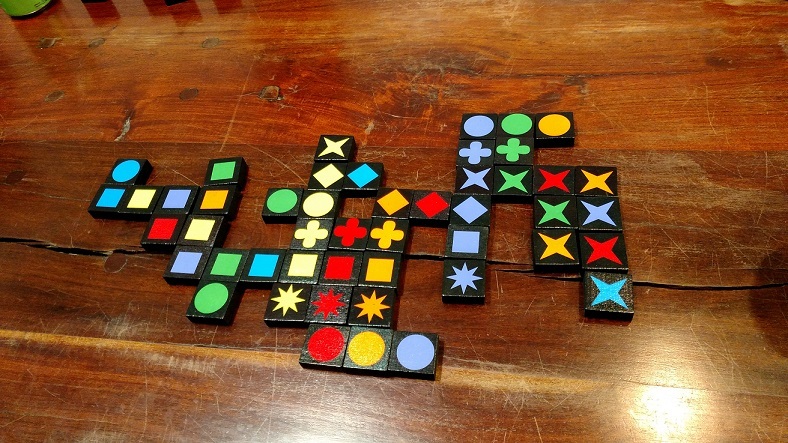 But you’ve left the board open for someone to play the sixth-colored star tile and score a Qwirkle, which means bonus points. So you have to play both offensively and defensively at the same time. At the end of our twenty-minute session, everyone had played well. We all finished within ten points of each other. Unfortunately, it was not meant to be for your PN-blogging pal, as I was knocked out of the tournament here, alongside Qwirkle-savvy Sue. But who was moving on? We didn’t know yet. You see, Nikki and Rick had tied at 60 points apiece, so a tie-breaker was needed. Yes, once again, Rick would be playing Slapzi. Since I was busy with my group, I didn’t see any of the highlights from Group 2’s session of Timeline. All I knew was that Jenn was going through to the next round. We switched games, and Group 2 started their Qwirkle game while we settled our tie with a round of Slapzi. In the end, Nikki bested Rick and moved on to Round 3. The four of us then settled in for our game of Timeline. There was still a chance for me to salvage the day and continue onward to Round 3 in the proud name of PuzzleNation. Success in Timeline depends on two factors: how well you know the events in your hand, and which events get played on the timeline before your turn. For instance, you might have several events that you suspect took place in the 1800s, but you’re not sure when. If there are several cards with dates from the 1800s already in play, you could have a very hard time placing yours. But if the timeline features events from much earlier (like the taming of fire or the creation of the moon) or much later (like the creation of CDs or the launching of the space shuttle Discovery), then you’ll be able to place at least one of your cards with relative ease. 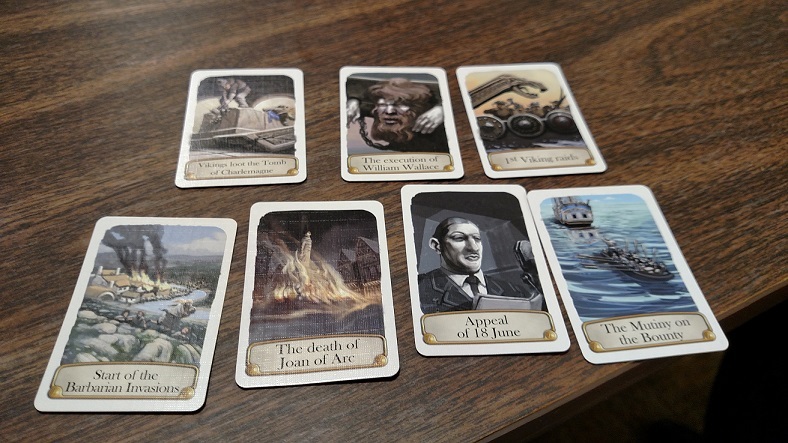 Naturally, the game gets tougher as the timeline fills out, and the gaps between cards get smaller. The first few turns went well for everyone. 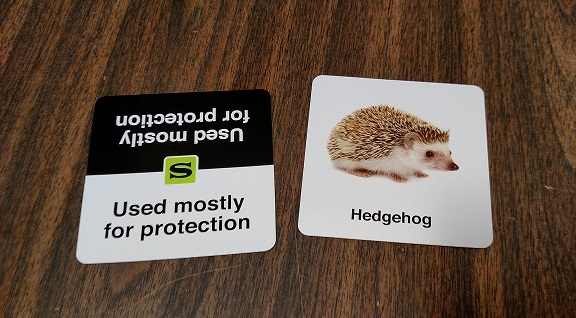 I think it was our third go-around before someone incorrectly placed a card. Rick and I jumped ahead with some lucky guesses (I mean, skillful application of vast historical knowledge), and soon, we were each down to three of our original seven cards. 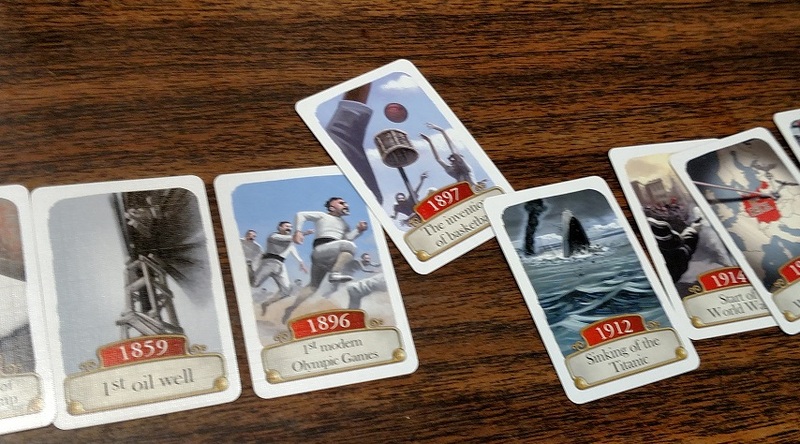 Unfortunately, I botched two cards in a row — including stupidly placing the Appeal of 18th June AFTER the events of World War II — and Rick calmly swooped in, placing his final card — the invention of basketball — in the correct gap in the timeline. No tie-breakers for Rick this time; he was moving on to Round 3. 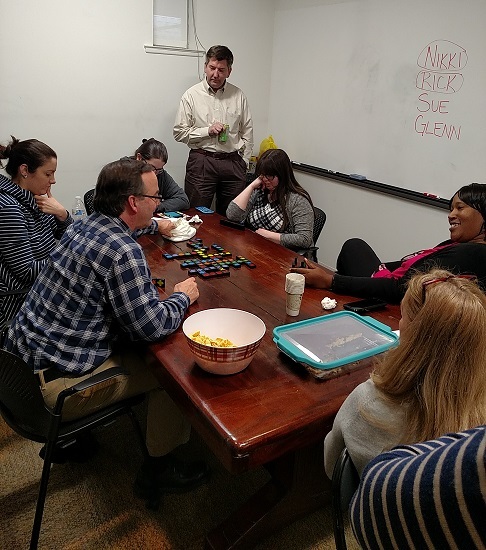 In the end, a surprise upset occurred, and last year’s champion Jen was knocked out of the running by Gordon, who joined Nikki, Rick, and Jenn as the contenders in Round 3. So no matter who wins this year, we’re guaranteed a new champion. Unexpected! So, alas, I shan’t be competing in either the semi-final or final round of this year’s tournament. But then again, that does free me up to take pictures, observe, add my own unique brand of obnoxious color commentary, and document the event in full for your reading pleasure. Next week, the remaining four players will try their hand at a game unlike any they’ve encountered in the tournament thus far. 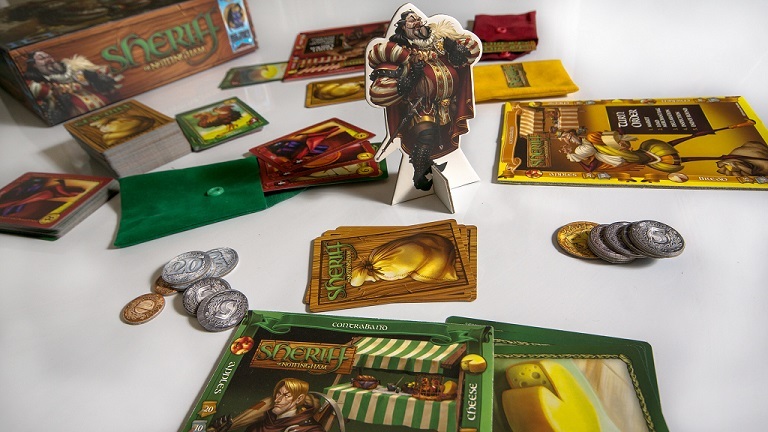 Next week, it’ll be about strategy, cunning, bluffing, cutting deals, and a fair bit of trickery, as Nikki, Rick, Gordon, and Jenn play Sheriff of Nottingham. The two players who score the most points will move on to the finals, which will be held at our annual International Tabletop Day event in the last week of April! 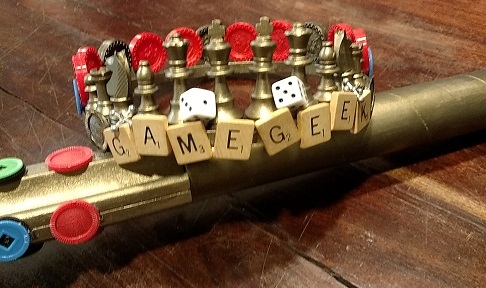 This entry was posted in Games, PuzzleNation, Puzzles and tagged bananagrams, DIY puzzling, games, Geeking Out, Holidays, International TableTop Day, on the dot, pdp tabletop tournament, Penny Dell Crossword App, Penny Dell Crosswords App, Penny Dell Puzzles, Penny Press, Penny/Dell Puzzles, Pop culture, PuzzleNation, Puzzlin' fool, qwirkle, sheriff of nottingham, slapzi, TableTop, tabletop day, Timeline, tournament, Wordplay by gmdirect. Bookmark the permalink.